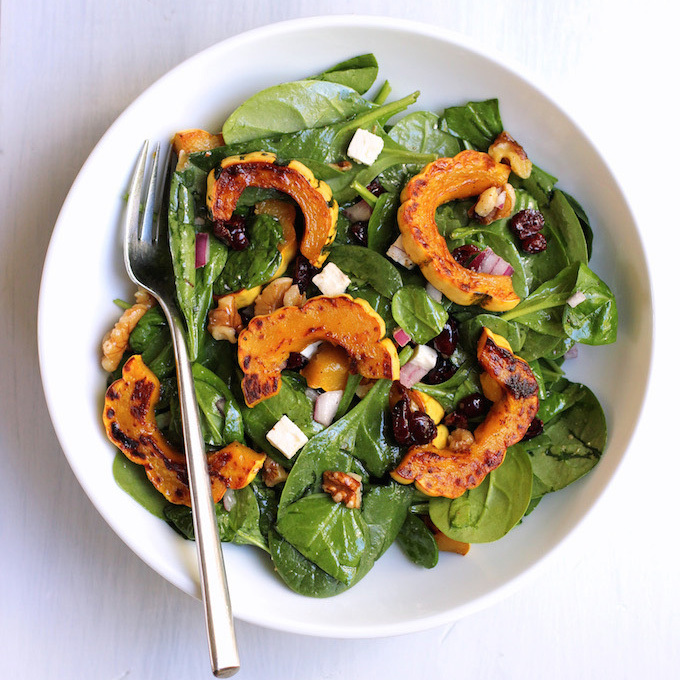 Delicata squash and spinach salad. 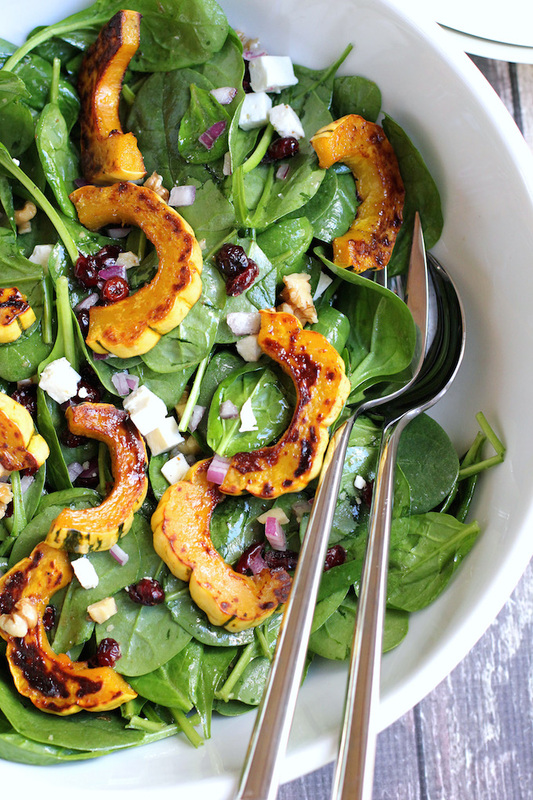 An easy fall salad featuring caramelized delicata squash, spinach, dried cranberries and walnuts. Now that the weather has finally turned here – it’s cool and rainy in Los Angeles – I’ve decided to make this delicata squash and spinach salad. It’s an easy, fall salad which features warm, caramelized delicata squash, baby spinach, dried cranberries, walnuts and feta cheese. The salad is tossed with a red wine vinaigrette that has a touch of honey. Delicata squash is a flavorful, orange, winter squash that has a creamy, rich texture. Where as most winter squashes are difficult to prepare – a delicata squash couldn’t be easier – no peeling necessary and it’s easy to cut up. It only takes 20 minutes to roast in the oven – caramelizing to a lovely golden brown. While it’s roasting you prep your other ingredients and can have this salad put together in under 30 minutes. To prep the delicata squash all you need to do is wash it well, chop the ends off, stand it on one end and split it down the middle – no peeling necessary. Next scoop out the seeds and then slice it into even slices – about 1/2 inch thick. Toss the slices with a little olive oil, ground black pepper and a pinch of salt and put it on a baking sheet – spread the slices out evenly so that they aren’t overlapping. Roast it in the oven for 20 minutes – flipping the squash after 10 minutes so each side caramelizes equally. 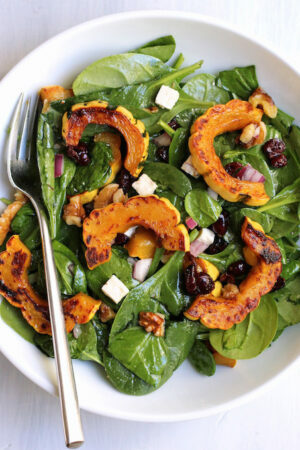 The caramelized squash pairs well with fresh baby spinach, tart dried cranberries, crunchy walnuts and salty feta. This is a warm, filling salad featuring fall ingredients at their best. Add a glass of merlot and a little french bread and you’ve got an easy, healthy dinner. Enjoy. While roasting the squash, you’ll need to turn/flip it halfway through the roasting process and the squash will be very soft – so use tongs to gently hold and turn them. The squash is very soft and delicate once it’s cooked. So I tossed the salad with 2/3 of the dressing before adding the squash. Then I drizzled the remaining dressing over the cooked squash and gently added it to the salad. If you can’t find delicata squash, butternut squash would be a good substitute. Butternut squash takes a little longer to roast – about 25 to 30 minutes. Rinse delicata squash well. Chop off ends of squash then split squash down the middle. Scoop out seeds and slice squash into 1/2 inch slices. Toss delicata squash with 1 tbs olive oil and a few twists of black pepper and a pinch of salt. Place on a baking sheet and even spread out the squash so it does not overlap. Bake the squash for 20 minutes in the oven. After 10 minutes – take the squash out and flip the slices so they will be evenly browned on each side – but the pan back in the oven for 10 more minutes. While the squash is cooking, wash spinach and add to a bowl. Add cranberries and walnuts to the bowl of spinach. Mince red onion and dice feta cheese. Add red onion to the bowl of spinach. Whisk together the remaining 3 tbs of olive oil, red wine vinegar, honey, dijon mustard, a pinch of salt and a few twists of black pepper. Pour 3/4 over spinach salad and toss to combine. Add diced feta cheese and toss gently to combine. Drizzle remaining dressing over squash slices (once they are out of the oven). Add squash to salad and toss very gently. I kept a couple of slices aside and then added to the top of the salad for presentation. This was a lovely salad, the carmelized delicate pares well with cranberries. Have to say had never seen delicate squash before! 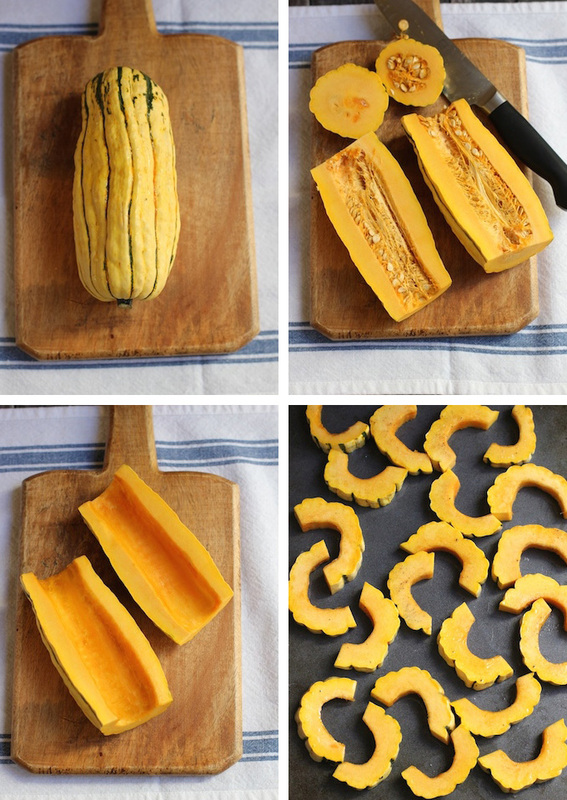 Delicate squash is so much easier to cook with then most winter squashes – glad you enjoyed it! What a pretty and colorful salad, Geraldine! I love adding squash to salads and bet this version is delicious with the feta and slightly sweet dressing. I love wintery salads like this one! What an absolutely stunning meal! I love the colour contrast there! looks so healthy and fresh! Hi Karishma – I really like the balance of the roasted squash with the fresh salad – it was a nice combination. Hope you try it – and thanks for stopping by. Have a great day! I’ve never tried delicata squash before, but I am going to have to try it! It is so pretty, and this salad looks like my kind of salad! I love feta, cranberries and nuts in my salads, and this looks seriously delicious! This is my first time using delicata squash and it was super easy to prep and really good – It was also great cold the next day. Hope you try it, Denise. I agree, Maryanne – It’s been the longest summer in LA – all the way up until the end of November! Hope you like the squash. Have a good one. I’m so jealous of your just-turning-fall weather! It’s winter coat season here and I’m not liking it one bit. I am, however, LOVING this squash salad! Pinned! Thanks, Sarah! We just got our first rain storm of the season and it’s so nice to see some rain – it’s been a long time. Hope you enjoy this salad. Have a good one. Lovely salad, Geraldine! The flavors, dressing and caramelized squash are perfect together. Adding the squash gives this salad a hearty feel and definitely would make a filling light dinner. I love how some squash can have it’s skin left on for eating. It makes the cooks job so much quicker! Your photography is just beautiful. Love the progression of the squash photos! Beautiful! 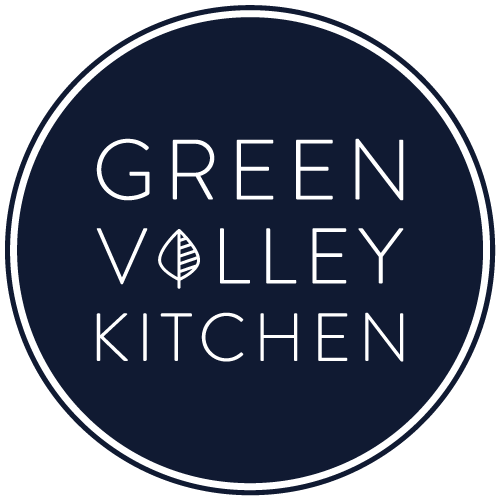 Thank you, Geraldine! Thanks, Traci! I am definitely a big fan of delicata squash. It has just the right amount of sweetness and the easy prep is a big seller for me. It was really good cold the next day as well. Have a great one! this is SO healthy I absolutely love new ideas for salads! this one looks de-lish! Squash is my favorite winter veg! Thanks for sharing this beautiful salad! Hi Anise – delicata is now my favorite winter squash – it was really good and so easy to prep. Have a good one and thanks for stopping by.